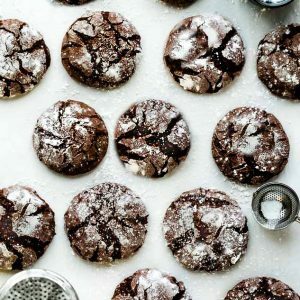 Keto Chocolate Crinkle Cookies – a classic holiday favorite made healthier with low carb, gluten free ingredients. Soft, chewy, fudgy and perfect for Christmas cookie platters. 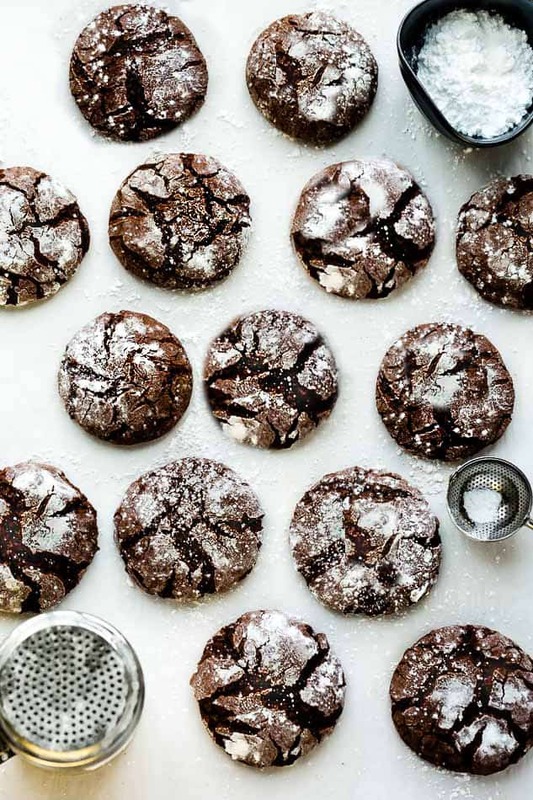 No Christmas cookie platter would be complete without Chocolate Crinkle Cookies. They are a holiday classic favorite with their soft, fudgy centers covered with snowy powdered sugar. These indulgent little treats are really simple to make and are great any time of year. Keto Chocolate Crinkle Cookies have the same fudgy brownie texture except that they are sugar free, gluten free and made with low carb friendly ingredients. 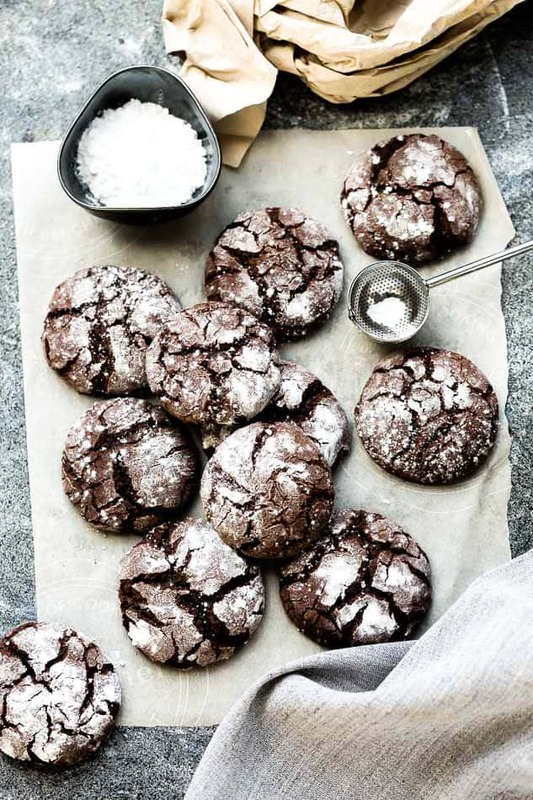 WHAT INGREDIENTS DO I NEED TO MAKE LOW CARB CHOCOLATE CRINKLE COOKIES? Powdered monk fruit sweetener: For rolling the cookie dough. Combine the dry ingredients. In a medium mixing bowl, whisk together the almond flour, coconut flour, cocoa powder, baking powder, xanthan gum and sea salt. Mix the dough. In the bowl of a stand mixer, cream together the butter and powdered monk fruit sweetener. Add the melted coconut oil, eggs, vanilla and the dry ingredients. Make the dough balls. Roll dough into 1-inch balls, and roll them in powdered monk fruit sweetener until completely coated. a parchment-covered baking sheet. Bake. Pop the pan into a preheated oven at 350°F and bake for about 10 minutes. Allow the cookies cool for a bit afterwards. Roll into powdered sweetener once more. 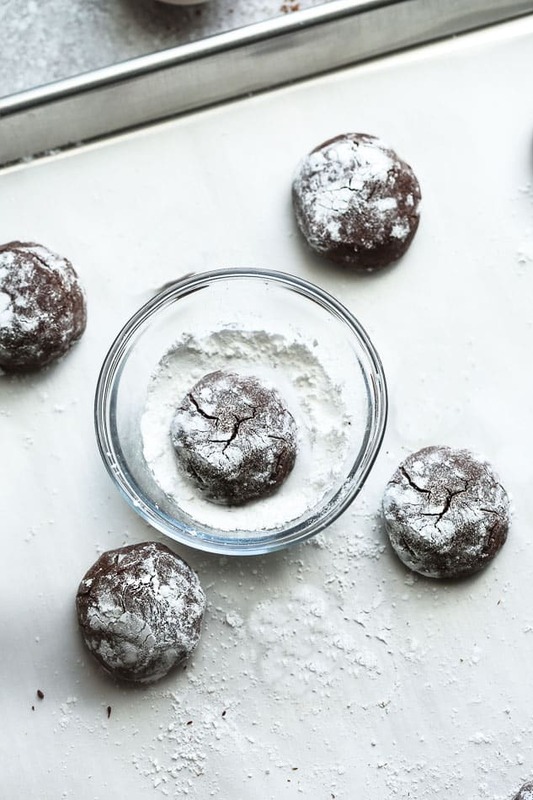 Enjoy or Store: You can eat crinkle cookies warm from the oven or store in an airtight container in the fridge for 5 days or freeze for up to 3 months. Absolutely! 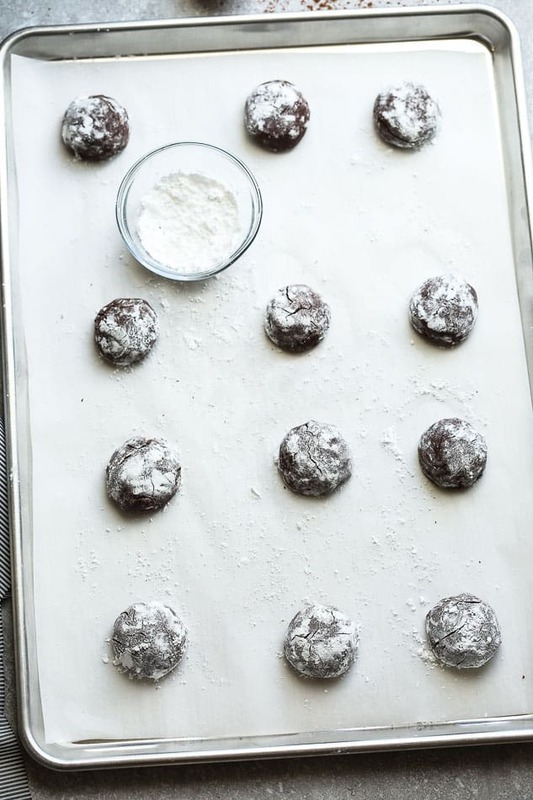 Just place the gluten free chocolate crinkle cookies on a large baking sheet and pop the tray into the freezer for 30 minutes. Once the cookies have hardened, transfer to a large zip-top bag or airtight container and store in the freezer for up to 3 months. HOW TO CUSTOMIZE CRINKLE COOKIES? Keto Chocolate Crinkle Cookies - a classic holiday favorite made healthier with low carb, gluten free ingredients. Soft, chewy, fudgy and perfect for Christmas cookie platters. In a medium mixing bowl whisk together almond flour, coconut flour, cocoa powder, baking powder, xanthan gum and salt, set aside. In the bowl of a stand mixer or using a hand mixer, cream together butter and monk fruit sweetener. Beat in melted coconut oil, eggs and vanilla. Slowly add the dry ingredients and mix until combined. Cover dough and chill in the fridge while you preheat the oven. Preheat oven to 350 degrees then line a large baking sheet with parchment paper or a silicone mat. Place powdered monk fruit sweetener in a small bowl. Remove dough from oven and scoop out and shape into 1-inch balls. Roll in powdered monk fruit sweetener then place on prepared baking sheet. Gently flatten each cookie slightly using the back of your hand or the bottom of glass. Bake in preheated oven for 10 - 14 minutes, or until nearly set. Allow to sit for about 2-3 minutes until cool enough to handle, then take each dough and roll in powdered monk fruit.